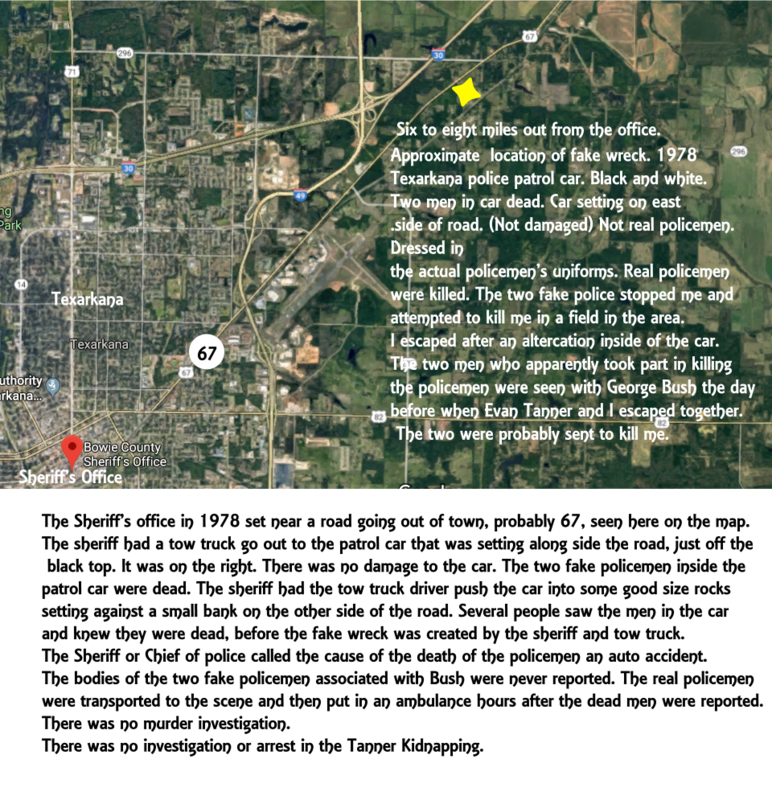 Update: Two killers that were associated with the men who attempted to kill me and kidnapped Evan Tanner were the same men who actually murdered the two policemen in Texarkana Texas in 1978. They were seen with George Bush (the president) twice in the house by us. Tanner and I both saw the two men with Bush. * I wanted to add a note to this article about Evan Tanner’s kidnapping in 1978. After we escaped the killers (read below) I drove him in a car to his aunts house. The police talked to his aunt on the phone. She told them where the house was. I talked to the police also, while I was in the house with Tanner and his aunt. There were other crimes related to what happened to Evan Tanner and myself in the house. There were other people who were held prisoner and tortured. The police apparently never arrested any person associated with the crimes committed in the house. The house was also a place where Rodney Alcala had killed people before. I was in the same house in 1975 when Rodney Alcala and men with him killed people and tortured people. Some pictures were taken. The picture of Evan Tanner was taken in the house in 1978. The picture of me was taken in 1975. There was also no questions asked to me by any police or authorities about the house when I was questioned, briefly, in 1975 in the FBI office in Tulsa Oklahoma. That was the 5th or the 13th of August in 1975. No actual investigation was ever done by the FBI on the killings in Hosston or the house, mentioned, that some people were killed at before the killers took us into the country south of Hosston to be killed there by FBI agents and others, including Jimmy Hoffa. The reason for the the murders has never been shared by the FBI or government. It was ironic to find out years later through a conversation with Evan Tanner that there was never any arrests by the authorities on anybody associated with the kidnapping of Evan Tanner or anybody else. One thing to note is that George Bush was in that house with me and Evan Tanner while we were held at gunpoint. The two men he came into the house with most likely killed the two policemen in Texarkana in 1978, after we escaped the house. The two men were wearing the policemen’s uniforms and were driving their squad car when they tricked me into going to talk to the sheriff of Texarkana. I did not recognize them in the uniforms and sun glasses. I got in the stolen squad car with them and wound up in another fight for my life on a road outside of Texarkana. The road went past the back of the sheriff’s office out of town. The two policemen did not die in the car that was stolen. They were apparently killed before the other men who were seen with George Bush took their uniforms and squad car. The accident that was recorded as the reason the two officers died on the highway was fake. The sheriff just had a tow trucj bang the squad car up and then took the dead officers, put their uniforms back on them and then had an ambulance transport them into town. I wander if they got the uniforms on the right officers? And what did they do with the men who were wearing their uniforms after they killed them? Those deaths and murders were related to what went on in that house too. I’m saying the whole thing was covered up. But the house and what went on there was associated with Alcala and the FBI murdering the two hundred and fifty people just south of Hosston. Imagine, while people were in church! None of the killers except Alcala has ever been arrested. No one involved in the house where Tanner was held captive and where I was also held has ever faced a shred of justice including George Bush. That’s expected, I guess in the case of the rich guy who becomes president. Not investigating anything became the normal routine in this case. Complete apathy about what happen to those people who were violated and murdered is what the FBI and other authorities had in concern of the hundreds of people murdered. I still want justice for what they did. The report on the kidnapping of Evan Tanner kept by the police department where Evan Tanners friends went to to get reports on the kidnapping incident in 1978 was falsified. The report listed me as a potential suspect. But Evan Tanner set the record straight with his friends after they abducted me, stuck me in the trunk of a car and took me to Evan Tanners house in California. They believed that I was the person who kidnapped Evan Tanner according to whatever information they got from the police who had any records of the incident. He told them that I wasn’t the man who took him to that house where he was held captive and tortured but that I was the person who he had escaped with. Knowing this, his friends had to know the police reports were fake. Were any arrests made at the house where Evan Tanner and other people were held captive after being abducted? No. If the information that his friends, who were doing an amateur investigation, had, was false, were there any reports on the actual incident? There didn’t seem to be any persons investigated at all for what happened there in the house to Tanner and other people, including torture and attempted murder and terrorism. And kidnapping. This house was the same house that Rodney Alcala murdered people in, in 1975. Took pictures of victims and took some people, including me from the house to Hosston Louisiana where two hundred and fifty people were murdered in August of 1975. It is known that Hoffa died on either the third or tenth day of August, 1975, it was on a Sunday. He was reported missing on July 30, 1975. It seems that anything, or anybody linked to the killings in 1975 in the area south of Hosston, Louisiana was covered up by the police and FBI. And whoever else knew about the killings. Murders. Witnesses were probably silenced. I was taken to a place and drugged right after being interviewed by the FBI in Tulsa. The Tuesday after the incident. I was called by the sheriff of Texarkana Texas and told that the FBI wanted to talk to me in the Tulsa office. I went to the office and after a five minute meeting they told me not to leave town. They recorded no particulars about what happened. No names, or specific locations, no numbers of people killed. Nothing. There is nothing on that report that would indicate that killers killed over two hundred people there in the Hosston area, or that the FBI agents, local police (off duty) other men and Hoffa killed those people and tried to murder me. Hoffa died on Sunday and the FBI showed up Two hours after he died. 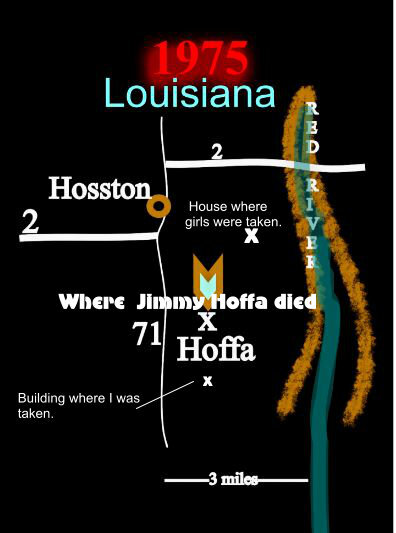 The FBI agents and the sheriff of Texarkana knew exactly where his (Hoffa’s) body was. I would say that he died the tenth of August. It was Sunday. Between the river and the road 71 – it is about two and a half miles. House where the girls were taken means the girls that were taken from the house where Alcala killed people before they took me ad other people from that house to Hosston. The building I was taken to was just north of the cotton patch. I was there to work in the cotton patch to weed out the rows. (Chop cotton as it is called.) It is very hard and hot work. That day was over one hundred. The next day was just as hot. We started on Friday morning. And stopped right after we started. Friday morning to Sunday afternoon I fought to survive. Previous Post Fuh Fuh Fuh Fuh –Fuh Fuh Fuh.